If you are about to engage in a stereotypically manly pursuit, you're going to have to get a little dusty, or dirty, or covered in lead-based paint or something. And while you could throw on an old, mustard-stained sweatsuit, you could also preserve a little bit of your dignity with the dashing Gentleman's Apron. 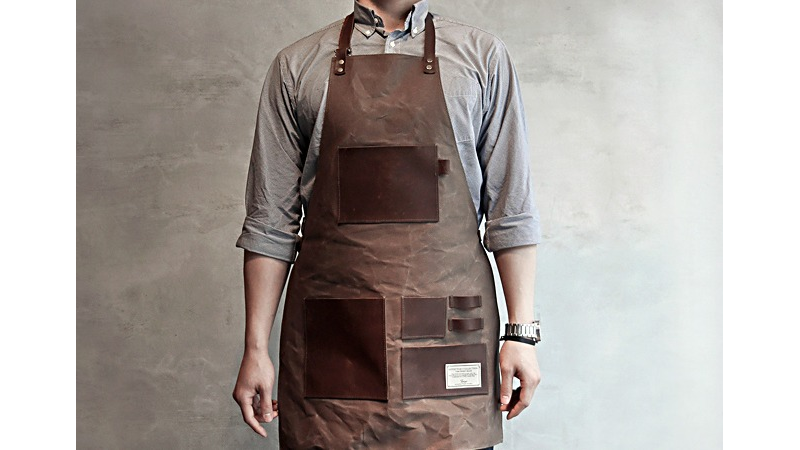 Made by Korea's TRVR, the Gentleman's Apron is made from durable waxed canvas with four real leather pockets and straps, perfect for holding the hammers and sharp implements you are bound to need as you go about your manly duties of fixing things, breaking things, and fixing things you broke while fixing other things. It even has a special sleeve to keep the pencil that you use to draw smiley faces on your handiwork, or whatever you use that for.